This fun, dynamic musical celebration of Passover combines traditional, contemporary and original music that will have your whole family dancing around your Seder table. 5. Where Is Baby Moses? 10. What Would You Bring? Bought this cd after a recommendation. It's really great! My kids took to it instantly, sang all the songs and keep asking me to play it. The songs are very "singable" even if you are not a singer. Very recommended. Its the best Cd. for Passover. I'm glad I found it. .... and we're pleased with the quality. Some new songs among the old and all sweetly done. A couple of the songs are kind of long for little children, but over all its good. 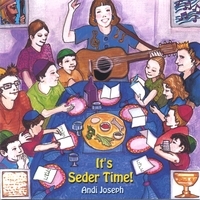 I received it in time for Passover and the children love it! Thank you Andi for making great music!!! Great CD! Looking forward to using it in my class! I love the songs. I plan on using it with my Sunday School class. The songs are easy to follow, and allow the children to participate.